Kristen Stewart, Julianne Moore and Elizabeth Banks attended The Museum of Modern Art Film 10th Annual Benefit - A Tribute to Julianne Moore last night(November 13th) at the Museum of Modern Art in New York. Kristen Stewart was on hand to support Julianne wearing a white crop top and CHANEL SPRING 2018 tweed embroidered crop trousers which she styled with black GIUSEPPE ZANOTTI sandals. Rocking an edgy haircut & smokey eyes, she finished up with silver jewelry. Julianne Moore wore a CHANEL FALL 2017 COUTURE ensemble which featured a strapless embellished tunic top with the matching skirt & arm warmers. I am not that crazy about this on her. In some images, it didn't look flattering. 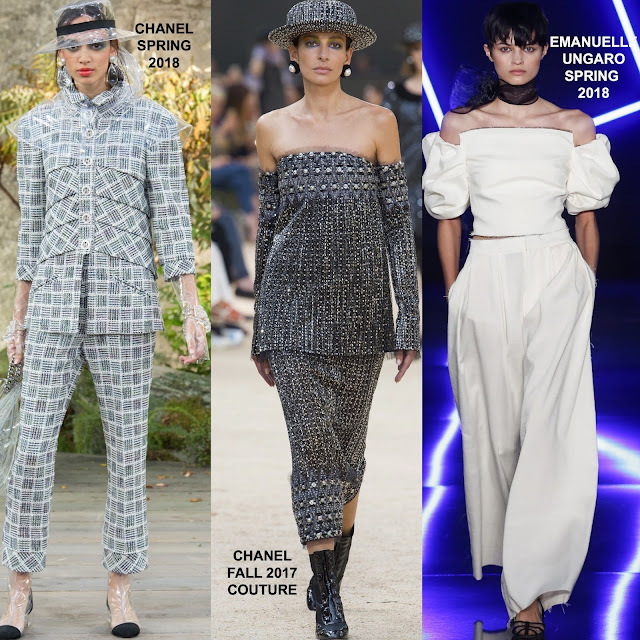 Elizabeth Banks opted not to wear Chanel and chose a EMANUEL UNGARO SPRING 2018 white off-the-shoulder jumpsuit with puffy sleeves and wide leg pants. Love Elizabeth's style but this is a no for me.